My local club had their annual Swap Meet a couple of Saturday’s ago. What a great time! And to think, I almost didn’t go. I had decided it was just too far for me to go, about 3 hours round trip. Lucky for me, Cory the club plant guru, posted on the C.A.F.E. forum that he was looking for someone to split a table. At any rate, I renewed some old friendships, sold some stuff, made some new friends, and had some great conversations. After just observing these beautiful fish for the last 18 months I decided it was time to set them up for spawning. I picked these guys up from Pete Mang on AquaBid back in 2009 as just some un-identified Danios that came along with the Hikari Danios being auctioned. I bought myself a Christmas present this year. 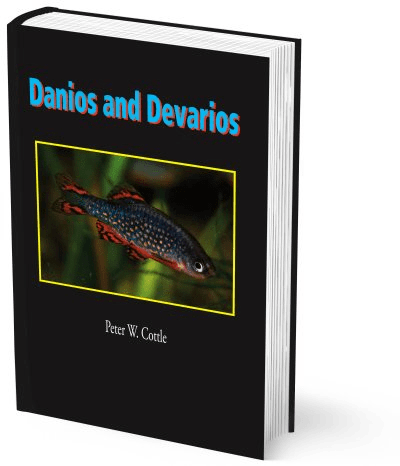 It’s a copy of Pete Cottle’s “Danios and Devarios”. What a great day! I spent the best part of today over in Columbus at Swiss Tropicals. It’s owned by my friend Stephan Tanner, what an asset he is to the aquarium hobby! Stephan is the US distributor for the Poret® Brand Filter Foam & Jetlifter lift tubes. That was part of the reason for the trip over. I bought enough foam to put dividers in two 55’s and a 75. 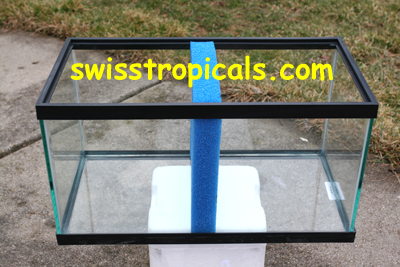 The cool thing about using foam is that it works as a filter as well as being a tank divider. I’m planning on using the tanks for grow-out tanks for fry and this looks like a great option to get more bang for my buck when it comes to maximizing tank space. Wow, what a great time I had at the CAFE, (Columbus Area Fish Enthusiasts), Convention today. I went with my daughter Darcy, and my 8 week old grandson Chris, (he’s on the home page looking at the turtle). They had some great speakers. Ted Judy talked about a collection trip to Africa. Rusty Wessel spoke about livebearers and auctioned some very cool swordtails. Brian Zimmerman had a great presentation on native american fish. My friend Stephan tried to get me hooked up with some very cool Danio tinwini. I even got to meet Dave Hale from Something Fishy up in Cleveland. Check him out on the Blue Zoo…..
We had a tasty lunch and purchased some very nice plants for Darcy’s tank too! After months of producing a fry here and there, I woke up to at least 3 dozen Danio tinwini fry this morning! When I picked up my breeding stock from Mark Denaro back in May of ’09, these fish were simply known as Danio sp. TW02. In November of 2009 they were properly named Danio tinwini after Mr. U Tin Win of the Hein Aquarium in Myanmar. Posted on April 5, 2010 July 9, 2013 Categories Fry, Spawning1 Comment on Success At Last! After 40+ years of fishkeeping here is the first blog/journal entry. I’ve always thought it would be cool to keep a journal of fish room happenings, but for one reason or another, I just never have. Well that’s about to change… let’s see where this goes.